"We stayed here as part of our Les Rives two day Mekong Delta tour and couldn't have been happier. It was on an island in the middle of the Mekong and the setting was wonderful and relaxing. We were met by Michel, the owner, and his wife and were informed we were the only guests that night, which meant the staff were all ours! We relaxed by the pool and had a wonderful dinner in the restaurant, with a very affordable bottle of French wine. Our room had a wonderful view of the Mekong and was fitted out with quality fittings, including a lovely four poster. The whole hotel is full of hand picked vintage items from the region and this adds to it's charm. All in all a great stay but be warned one night won't be enough in this beautiful resort. " My Tho - is the gateway to the Mekong Delta. 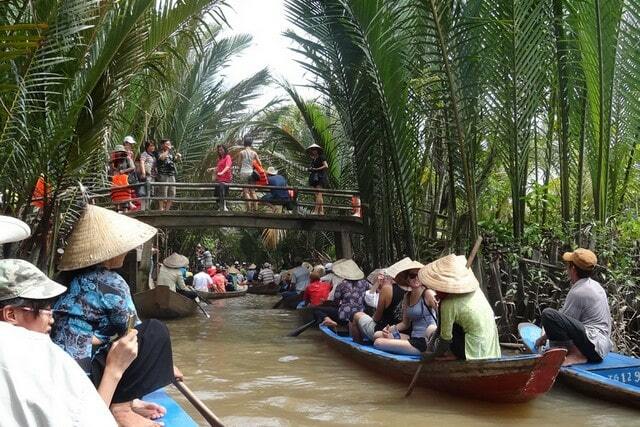 But .... if you want to visit the floating markets, you better go to Can Tho. Because My Tho is situated close to Ho Chi Minh City (75 km), you'll see a lot of day-trippers from the city. This results in a group of pushy salesmen, crowding every tour bus, when the bus arrives. The tourists want to have taste of the river life. A flotilla of boats daily sail along the islands and local tourists visit the houses, where the population has created something beautiful, although many also are floating along the city. The promenade along the river makes it pleasant to walk. The town is easy to explore by foot, including the cozy, lively market (D Trung Trac). 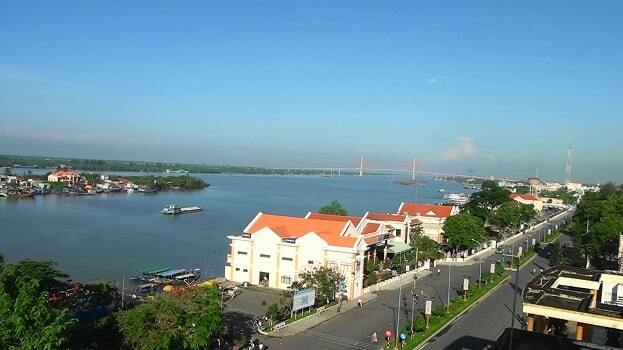 My Tho is the capital of the province of Tien Giang. My Tho was founded in the 1680s by Chinese refugees, who were coming from Formosa (now Taiwan) after the fall of the Southern Ming Dynasty. The economy is based on tourism, fishing and the cultivation of rice, coconuts, bananas, mangoes, longans and citrus. At that time this was a traditional Khmer-dominated region. The Vietnamese were pleased to have enterprising Chinese in this region. Two centuries later the French made a garrison in My Tho. They were attracted by the rice and fruit crops. They even laid a railway line to Saigon (HCMC). In the last war the Americans were always present in the city. If you take a walk through the city and you visit the market, you will see commercial importance of the city and the region. The traffic on the river varies from elegant sampans to large, bulky cargo boats, rough and unpainted. You can see them best at the Lac Hong Park at the east end of the boulevard. If you have sharp eyes, you can see the most characteristic feature of the boats in the delta: feline eyes painted on the prows of ships. In the evening, especially on weekends, the boulevard is filled with families strolling along the promenade. Also, you see vendors of balloons, popcorn and even tropical fish. At night it is the place for lovers, crawling on their motorcycles, while others playing with a shuttlecock (badminton) on the street under the watchful eye of a statue of the nineteenth-century French anti-hero Nguyen Huu Huan, who graduated in My Tho. If you are traveling individually and want to make a boat ride, you just walk along the promenade. You will be found rather quickly by touts, who want to lure you to a boat. Prices start at 400,000 dong for four hours sailing for three people, but if you show little interest, the price drops quickly to 200,000 dong. The office of the "official boat tour office" has warning sign against the use of such touts. In practice, we can only recommend to clearly negotiate. Stick to your price and itinerary, before boarding the boat. Don't hand the money over, before the boat has returned to My Tho. If you are also being accompanied by a guide, make clear in advance that the guide is included in the total price. The more intrepid travelers and and those who are interested in something adventurous, can also take a "slow boat" from My Tho to Tan Chau, which sails upstream. Tan Chau is near the border with Cambodia. When we made the trip many years ago, it took us a half day (you sleep on the boat in hammocks) but we were told by our most recent visit, the trip now takes three days. An explanation why we didn't get. The boats sail every day. Mr. Nip, a cyclo driver (he finds you) who really speaks excellent English and knows a lot about My Tho and he probably knows when and where the boat departs. My Tho is also known for its vast Vinh Trung Pagoda. It was built in 1849 and covers an area of over 14,000 square meters. It is the largest pagoda in the province of Tien Giang. 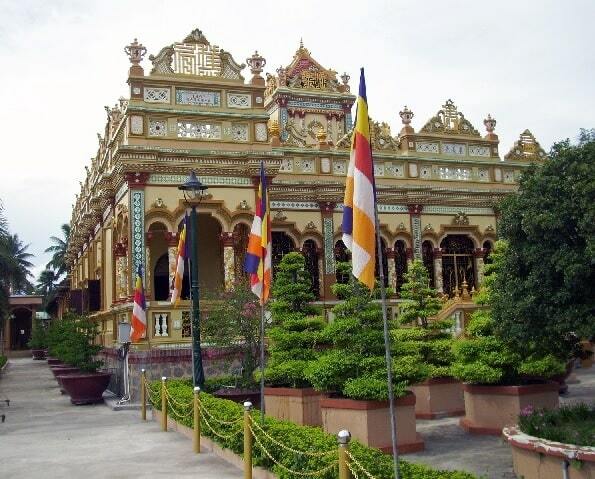 The Vinh Trang Pagoda is located about 3 kilometers from the center of My Tho. The most striking of the Vinh Trang pagoda is it's architecture. It is a combination of European and Asian architecture (French colonial architecture, romance, Thai and Cambodian In other influence of Champa). The pagoda consists of a total of 178 columns. At the back of the Vinh Trang pagoda is a small garden with bonsai trees, a lake with fish and various Buddha statues, of which two are significant in size. At 12 safe kilometers of My Tho is the Dong Tam snake farm, which covers an area of 12 hectares. On this snake farm are different types of snakes. They use their poison for medical purposes, but also to find their antidote against snake bites. The more adventurous tourists can try cobra, because this is one of the dishes in the restaurant. A better place to explore the Mekong Delta is Ben Tre (in the menu).